First Sentence: It was way early, like 5:30 in the a.m., when Billy Ray Dent eased his metallic blue pickup and bass boat into the parking lot at Vera’s Largemouth Café. Reason for Reading: I was asked to review this book for Front Street Reviews. 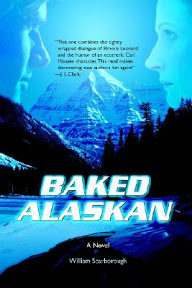 Comments: William Scarborough’s Baked Alaskan is one of those thrill ride novels you pick up and read for a good time. It is a fun and entertaining book, jam packed with action and a touch of wit added in for good measure. A healthy suspension of disbelief is required. Former Texas Ranger, Billy Ray Dent took early retirement from his security job with Tech Instruments and has settled into life as a fishing guide on an east Texas lake. When one of his former bosses, Cole Parker, comes for a visit and a bit of fishing, Billy Ray suspects there is more on Cole’s mind than he at first indicated. His suspicion proves true when Cole Parker ends up dead, shot while on Billy Ray’s bass boat in the middle of the lake, reeling in a 10-pounder. Taking his friend to safety after dodging bullets himself, Billy Ray promises his dying friend that he will warn Cole’s spitfire girlfriend, Darian Tonelli, that the killers are after the chip. Cole gave his word that Billy Ray would receive two million dollars for his trouble. Cole Parker created a chip that will revolutionize television viewing, and the CEO of Tech Instruments will stop at nothing to get his hands on it. Likewise, a German company has taken an interest in the new technology and is working with the Russian Mafia to collect on that chip. With mob hit men and corporate goons hot on their trail, Billy Ray and Darian go on the run, fleeing for their lives. Billy Ray Dent is one tough cookie that any woman would want on her side in a race for her life. He is quick on his feet and in bringing a plan together. He’s rough around the edges, but has a kind heart. Darian proves to be his match, an independent woman who has had to prove she’s more than just a pretty face by learning to do for herself—and there is not much she cannot do. The corporate goons and mafia hit men are a bundle of bumbles as they try to rein in their prey. Their actions are not always pretty, although author William Scarborough humanizes them, making it impossible not to sympathize with them even if just a little. Baked Alaskan is an action packed novel that takes readers from the lazy life on a Texas lake to the wilds of Alaska and then onto the busy streets of New York City. William Scarborough’s book is just plain fun and entertaining. It’s almost as good as the dessert by the same name. Favorite Part: Ray Dent is quite a character! He is an upstanding sort of guy. And I sure would like to get to know Vera a bit more. She seems like a neat character.